Are you looking for the best Xbox One controller charger, but seem to be going nowhere? There are many chargers on the market, however choosing the best one for you may be tricky. If you’re buying a charger for the first time you might not know what to look out for. Therefore, reading this article may help you pick out the most suitable option for you. Everybody is different and we all have different needs, some people might need a faster charger, some may need dual chargers. So what works for somebody else might not work for you. Having a good controller charger is one of the most important Xbox One gaming accessories for a gamer to have. That’s because changing the batteries can and will get frustrating for anyone. Furthermore, charging your controller using a charger made for the Xbox One controller is more practical, because once you finish gaming all you have to do is plug the controller into the charging station. Whereas charging your batteries in an old fashion battery charger is more of a pain and less practical for gamers. Furthermore, Xbox One battery chargers can be used with a USB depending on the model type, which makes it a lot easier to use. In this case, you will be able to charge your battery using your computer or other devices. In a hurry? Here’s a quick comparison of the top selling Xbox One controller chargers. How do I pick what is best for me? Well, this depends on a lot of factors. How much are you willing to spend? It is always better to spend additional money on a product as the quality will certainly be better than average. Also, expensive products tend to last a lot longer than others, since the manufacture uses better materials to create them. So if you want the best Xbox One charging station spending more would be better. Charging speed: Not all chargers will charge at the same speed, as they will have a different output rate, which is measured in amps. So picking something with high amps is going to charge your controller faster. Don’t go cheap: When buying any electronic device it is better to save up and spend a lot on something that will last. This includes the Xbox One charging station. Size: Do you need to charge 2 controllers at once or just 1? If you are a solo gamer then going for one signal space charger is better for you. As they will most likely cost cheaper than ones with two spaces. Now that you have a quick overview of what you should be looking for in the best Xbox One controller chargers, picking what is best for you is going to be a lot easier. There are many differences between a lot of them such as battery power, durability and charging times. Try not to settle for something that you might not like, instead search and wait for something that meets your needs. There are many options on the market, so the chance of you finding a good Xbox One controller charger for you is high. Going for the more expensive options is better most of the time, because you are more guaranteed that the product is going to be higher quality. Also, you can check the brand too, since if it is made by the more well-known tech companies then the charger is going to be more reliable. However, getting a product from the original company can sometimes be bad, as most of the time their products are overpriced. On the other hand, there can be a chance that getting an Xbox One controller charger from a lesser known company can be better. How long will the batteries last? Durability is an important factor when it comes to batteries. Most cheap AA batteries that you will get from your local store won’t last long. However, buying something like a Lithium ion battery will last you a really long time, but they are way more expensive. Also, when buying an Xbox One charging dock they normally come without batteries, so look closely and decide if you should purchase batteries separately. Do you game a lot? Then going for docks with long USB cables may be best for you, since you can play whilst charging the Xbox One controller. The only negative thing about it is that the controller might get hot, because you are playing and charging the controller simultaneously. We hope that this article is going to help you pick out a good Xbox One charging station. Consider each option on this list as they are the top selling products today. Try and compare them to each other, look at the advantages and negatives of each one to end up with something that you want. There are many options so don’t lose hope if you can’t find when you are looking for the right Xbox One controller charger. The first product we will be looking at is the Nyko Charge Base for the Xbox One. It’s a great charger for someone who plays CO-OP a lot, since you can charge more than one controller simultaneously. Also, it being a charging base means you won’t have to struggle taking out batteries whenever you want to charge the controller. However, you must make sure the batteries you are using are rechargeable, otherwise the battery will overheat, which can cause it to leak or even explode. Before using the Nyko Charge Base – Xbox One you should look into buying the best rechargeable batteries for Xbox One, because these batteries will last longer and be more effective than ones you will find in the market. Going online and buying batteries made for the Xbox One is a great option, since the item is made for the that specific console. Keep in mind that these batteries are more expensive than other basic ones, however what they bring to the table is worthy of consideration. This product comes with two NiMH rechargeable batteries, which is brilliant as they are very durable batteries. In fact they might even be one of the best batteries for the Xbox One controller. Also, it has LED lights that will indicate when the controller is fully charged. 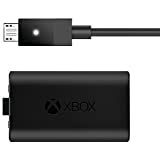 In addition, this charging base is portable, therefore you could take this to a friend’s house to play making this one of the best Xbox One battery chargers on the market today. If you’re worried about the price then don’t be. This charging base is very cheap compared with some of the other options. Plus, most charging docks at this price will offer only one port, but the Nyko Charge Base – Xbox One offers double that. The Xbox One Play and Charge Kit is great for solo players, because it comes with one rechargeable lithium ion battery pack. That means you won’t ever have to purchase AA batteries for you controller again. The benefits of lithium ion batteries are that they will last much longer than the average battery. Also, they won’t lose as much energy over times if you don’t use the controller like most AA batteries. This is the best rechargeable battery for the Xbox One, however the only disadvantage is that it costs around 40% more than the average one. 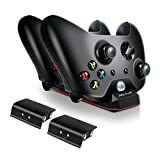 This charging kit is also compatible with the original Xbox One wireless controller and the new Xbox One wireless controller. Another great thing about this product is that it will charge the controller in under 4 hours, which means that you can pretty much game none stop. Although this charger cost a little bit more than other products it has many pluses that make up for its price. When buying any electronic product a rule of thumb is to spend more, to ensure that the item you buy will be of high quality. If you buy a cheap charger and it breaks after a few months then purchasing another one will cost the same amount as getting the expensive one in the first place. The Xbox One Play and Charge Kit is very simple to install. All you have to do is take out where you would put your AA batteries and install the lithium ion battery. If you do see yourself finding this step tricky then going on YouTube for tutorials is a great option. Charging the controller is extremely simple as all you have to do is plug in a USB. 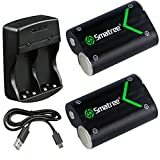 One of the best batteries for Xbox One controller is the Smatree Rechargeable NI-MH Battery 2000mAH, as it has a lot to offer. Because it is a 2000mAH battery this means that it will have much longer running time than the OEM battery. In addition this is one of the better Xbox one battery chargers on the market, since it can charge up to 2 batteries at once. Furthermore, charging the batteries to 100% doesn’t even take that long without interruption. This Xbox One battery charger will fuel the battery in around 6-7 hours. What if I forgot that I was charging the batteries, will they over heat? The answer to that is no. when the battery gets fully charged there will be a light that is going to turn green. When this happens the Xbox One charger will turn off to prevent over-voltage to the batteries. Also, the charger comes with a timer that calculates when the charging time exceeds over 7 hours. This is also to prevent the batteries from overheating. However, if you take out the batteries before the light goes green then the charger will re-calculate how long the batteries need to be charged for. Can I charge these batteries at night? With it having over heat and over charge protection putting these batteries in at night shouldn’t be a problem. Also, the casual gamer will get around 30 hours of battery life before having to charge them. This is the best Xbox One charger for those gamers who game want to game all day, but can’t because their batteries would run out. This package comes with two Smatree batteries for the Xbox One, one Smatree dual channel charger and one USB cable. High Capacity: Built-in 1200mAh rechargeable Lithium Battery provides the maximum amount of energy for original Xbox One ,One S,Newest One X and Xbox One Elite controller ,recharge while you play or afterwards allowing you to enjoy hours of uninterrupted playing time. 100% Satisfaction Guaranteed Warranty ! Try it out today and enjoy your gaming time as long as you want.,If you're not fully satisfied just contact us for a new replacement or a full payment refund within 90 days. Are you the type of gamer that plays all day, but can’t because of battery issues? Then the Xbox One Controller Battery Pack Kingtop 1200mAh may be the option for you, as it comes with a 10ft USB charging cable. So you can play and charge your controller at the same time. This could even give you a nostalgic feeling if you played on the retro console that had wired controllers. The battery is made of Lithium, which is excellent as these batteries will last a lot longer. Furthermore, the playing time is very long and charging time is short. To fully charge the batteries it takes around 3.5-5 hours, which isn’t that long. It even has an LED light that will shine red when charging, indicating that the batteries are not fully charged. Another reason why this is one of the best Xbox One controller chargers on the market is if you see that you’re going out of power all you have to do is plug the 10Ft USB, and you’re good to go. This battery is also very portable weighing at 47g, so going to a neighbor’s house to play is very easy. Also, it has over charge protection, which will protect your batteries making them last longer. This product has a 90 day guarantee so if you accidently break it or something happens to it then you’re completely fine, or if you dislike the product then you can get a full refund. This charger is compatible with Xbox One or Xbox One S controllers. In addition, you won’t have to buy anymore AA batteries when using this product. 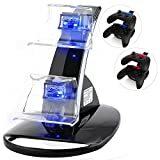 Another excellent Xbox One charging station is the Jelly Comb Xbox One Dual Controller Charging Dock, as there are many benefits. First it has dual 1200mAh rechargeable Li-Polymer batteries that will provide maximum energy to the controller. Another reason why this is the best Xbox One charging station is that it can be used on all the original controllers like the Xbox One, Xbox One S and the Xbox elite controller. This is a must for any serious Xbox One gamers as it is specifically designed to charge two controllers or batteries individually. So you can play with one controller while the other one is charging. In theory you could play 24/7. These batteries give up to 11 hours of playing time, which is a tremendous amount, as you only have to charge them for 2 hours. The LED light will show you the status of the batteries. Red meaning not fully charged and blue meaning ready for gaming. This Xbox One controller charger even has an over charge protection and security circuitry, which stops the batteries from overheating when the battery is fully charged. Consequently, you can charge the controller overnight if that is more convenient for you. This Xbox One controller charger comes with one dual charging station, USB charging cable, two 1200mAH rechargeable batteries and 12 month warranty. When purchasing these types of products you always want to make sure that there is a warranty just in case something happens. The Venom Xbox One Twin Docking Station is by far one of the best Xbox One controller chargers on the market. It has a dual dock so you can charge two controllers at once, making it far better than most chargers, since a lot of them only allow charging one controller at a time. It also comes with two Nimh rechargeable battery packs. Nimh batteries have 30-40% more capacity than standard Ni-Cd batteries. In addition, they are more environmentally friendly. Is the Venom Xbox One twin docking station too expensive? Although it costs more than the average Xbox One charger it certainly is one of the best options on the market, as it has many more features than most. You can charge your batteries using the USB cable that they include and if you’re a gamer who likes style they even made the dock polished black so it matches the controller. After fully charging the batteries they should last about a whopping 18 hours. So you pretty much never go out of power, thus having battery problems will be a thing of the past. 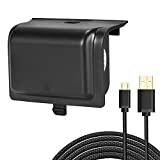 This product is eligible for Amazon’s 30 day return system, which means if you think the charger is not for you then you will be able to return it. There will also be a red LED light indicating that the batteries are charging, once they go green your batteries are at 100%. It is also compatible with the newer elite Xbox One controllers as well as the older standard ones. The CBSKY Xbox One/One S Docking Station is excellent for any gamer, since it offers everything that a gamer would need. It is compatible with the Xbox One and the newest Xbox One S gaming console. The docking station is powered by a USB port or any PC power adapter. Also, when you connect the cable it will allow charging whiles still being used. Plus, this Xbox One charging station can charge up to 2 controllers at once. Charging a single controller will take up to two hours, however when charging two controllers at the same time it will take around four hours. So you might consider charging one controller while playing and switching it up. What about the price? This is one of the cheaper charging stations compared to what it has to offer, but it comes without batteries. This is the only minus when considering this product, however you can always buy batteries separately. Is it worth buying without batteries? Yes, as you can buy batteries separately on the same site. There are many batteries to choose from. Go for the more expensive durable ones, since they will last longer. Another thing to consider when buying batteries is how much mAh they have, because that indicates how much energy can be stored inside of them. Are you looking for something rechargeable in an Xbox One controller charger? Then the Venom Xbox One Rechargeable Battery Twin Pack might be the best option for you. It comes with two 700 mAh NimH rechargeable batteries, which will last for hours, making them especially good for gaming as you won’t run out of battery power so quickly. It also comes with a 2 meter USB charging cable with a split on the 1 meter mark. So if you want to play at the same time you are charging them this is great for you. In addition you can play with someone else too, since it has a split at the 1 meter mark making it less of a hassle to play. Charging time is one of the biggest enemies of a gamer. However, the Venom twin pick avoids this as you can play whilest gaming. Plus, you only have to charge the batteries for a maximum of 2.5 hours to get at least 18 hours of gameplay. There will also be an LED indicator that will tell you if your batteries are fully charged or if they are still charging. Martynas Pupkevicius is a freelance writer who writes articles, blogs, reviews and webpage content on a wide variety of topics. Enjoyed the quality of this review? Then get in touch for more of the same.